Learn how to manufacture liquid laundry and washing powder soap by attending our course. The manufacturing of liquid Laundry and washing powders soaps can easily be accommodated in a garage. If you are considering starting a business in making and selling liquid laundry soap and washing powder soap, we have the course. 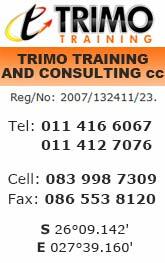 Trimo Training and Consulting is precisely what you need in order to propel your idea, and new business, into action. Making Laundry powders and Liquid Laundry detergents is something that requires some background knowledge and know-how. You cannot expect to just know what to do and this is why our workshop is designed to teach you how to make the best detergents on the market, and to make it available to your clients at a cost effective rate. Liquid Laundry & Washing Powder Course. Course Dates: 11 May OR 21 June 2019. One area of interest on this particular type of market is a range of washing detergents for clothing. You are sure to find that our course focuses on this type of cleaning product and learning the formulas presented to you, you can be making the best laundry detergent soaps known to your area. 4 Quality Formulations with practical hands on training provide 4 different streams of income. Some people use washing powder to wash clothing, others prefer liquid washing detergent to wash their clothing. Thank goodness that we do not all think the same about washing powders and liquid washing detergent as that would be quite boring! After completion of our course you will be able to effectively and accurately manufacture the products in the above mentioned package. You can expect for this detergent manufacturing course to prepare you for what the Liquid Laundry and soap powder products market has to throw at you. This type of business is ideal for the entrepreneur looking to start their own business. It will require very little in terms of space in the beginning– a double garage should be fine and you will find that the overhead costs are kept to an absolute minimum. Book your space on our next course and prepare to learn skills that can set you free financially in the very near future. Cost of the 1 day training course and use of the 4 formulations is R6100. Apply for the Liquid Laundry & Washing Powder Course.